This credit card issuer has had a tough run over the last six months. What will it take for that bad luck to continue? If you shop using a retail store's own branded credit card, there's a pretty good chance you're a customer of Synchrony Financial (NYSE:SYF). From gas stations like BP to Best Buy to Wal-Mart, Amazon.com, or Lowe's, when you use your store credit card, Synchrony Financial is the bank sitting behind the scenes managing your transactions, balances, and payments. Synchrony's stock has fallen 8% over the last six months, well behind the S&P 500's 4% gain. It's impossible to know which way the stock will turn next in the short term, but if any of these three things happen, I think Synchrony Financial stock will fall farther still. Synchrony Financial reported an unbelievable return on common equity in 2013 at over 37%. Since then, that number has come back a little closer to earth. In 2014, the company reported 26% ROCE, before declining further in 2015 to 19%. These are strong ROEs, but it's clear that the trend is moving in the wrong direction. For context, other credit card companies have been far more consistent in their returns over the same period. Three years ago, Synchrony's return on equity was well above that of its competitors. As of 2015, however, its performance has fallen behind both American Express and Discover Financial Services. If this trend continues, expect the stock to slump. One way Synchrony has achieved high returns in the past is by issuing credit to the subprime market. Subprime borrowers have lower incomes, worse credit histories, and represent a higher risk of loss for the bank. Worse yet, in the credit card business, there is rarely any collateral to protect the bank from losses and charge-offs. Conversely, though, banks can and do charge these customers higher interest rates to compensate for the increased risk of their poor credit profile. It's a high-risk, high-reward proposition. If there is a decline in credit quality, Synchrony's portfolio of subprime credit could be a major force to the stock's downside. The company currently has a net charge-off rate of 4.32%. That's 49% above the industry average. A seemingly small increase in charge-offs may not appear to be a big deal for a large, diverse company like Synchrony. However, because the company leverages its balance sheet, even a small increase in losses could be devastating for the stock. To understand the impact of balance sheet leverage, let's assume a hypothetical bank has 10 times more assets than it has in equity, so it's leveraged 10 times. If just 10% of this bank's assets are charged off -- like, say, its subprime portfolio -- that 10% loss would wipe out the bank's entire equity base. This is a risk that every bank faces, but at Synchrony, it's made worse by the concentration of subprime credits. Synchrony's assets-to-equity ratio is 6.7 times, which isn't overly aggressive by bank standards but still represents a lot of leverage for a company that's relying on subprime borrowers to repay their credit card debt. Because of this leverage, a small increase in charge-offs could have a very meaningful impact on the bank's capital position and stock price. Consumer credit in the U.S. grew by $17.2 billion in February, the 54th consecutive month of growth. It's impossible to predict when that streak will end, but if it does, it could push Synchrony Financial lower. Increasing consumer credit benefits all credit card companies -- American Express, Discover, Synchrony, and others alike. More overall debt increases the size of the market in which they all sell. If the reverse happens, it means the same banks are competing for fewer customers, hurting everyone. One sign that the growth streak could be nearing an end is the increase in the U.S. personal savings rate in recent months. U.S. 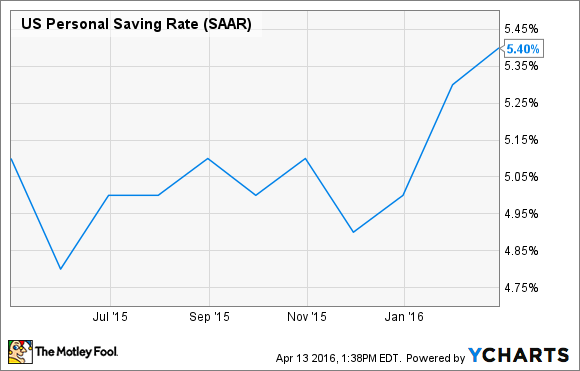 Personal Savings Rate data by YCharts. Credit card companies tend to prosper when consumers are spending more. However, if consumers are saving more on a percentage basis, that means they must be spending less. Some economists think that the rise in the savings rate could be an early indicator that consumer credit may be on the verge of pulling back. That's not a good thing for credit card companies like Synchrony Financial. Without a crystal ball, it's impossible to know how any of these trends will play out over the next few quarters. However, if Synchrony's return on equity, credit quality, or macroeconomic environment deteriorate, then I fully expect the stock to fall.